Posted by Destin Real Estate Sales on Thursday, March 2nd, 2017 at 12:38pm. Ocean Reef has just listed two outstanding fully furnished six-bedroom vacation homes for sale that are close to the beautiful white sand beach. Both are located on Open Gulf Street just an arrow’s shot away from the luminescent waters of the glowing gulf. 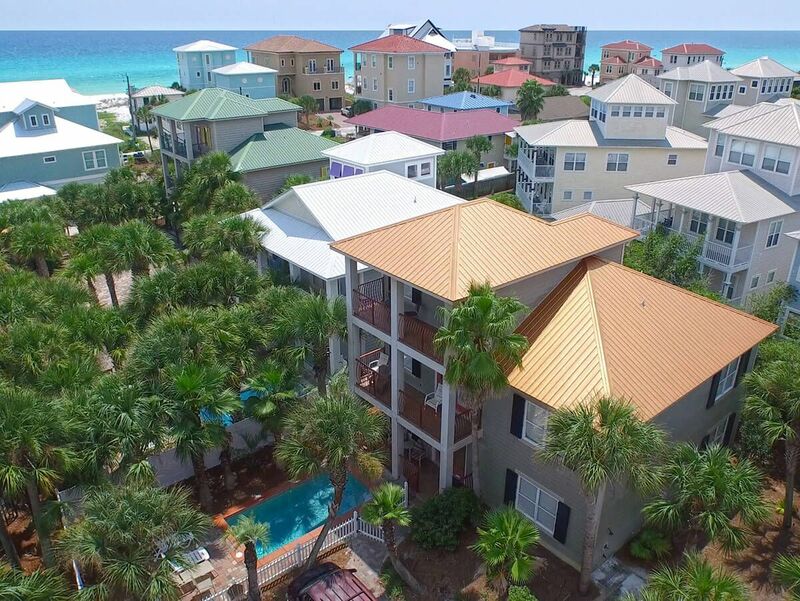 The striking beach is close by at this awesome location near Scenic Gulf Drive, which is highly sought after among vacationers since it is in the heart of Miramar Beach. This is minutes away from popular gulf front restaurants, championship golf courses, grocery stores, pharmacies, wine outlets and bargain shopping at Silver Sands Premium Outlets. 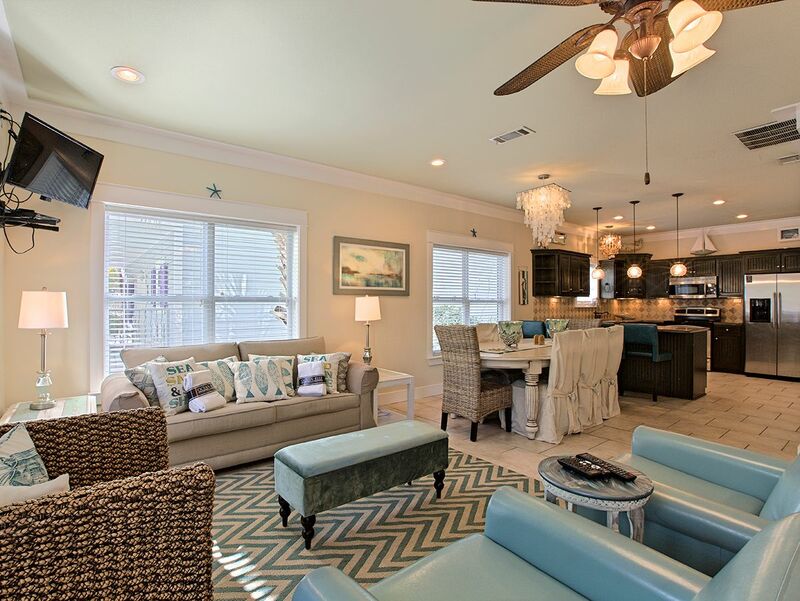 It is also conveniently close to restaurants, lively bars, seasonal festivities, concerts and abundant amusements at Baytowne Wharf at Sandestin. For sale at 140 Open Gulf Drive is a 2,898 square foot with six bedrooms and seven-bathroom property that is known as Shell Shack to its happy beach going guests. The home is in a virtual forest of palm trees and has a private pool with a new built-in Tiki Bar deck. This Tiki Bar includes a refrigerator and flat screen TV. The interiors of this home have been freshly painted and partially refurbished with new furnishings. The first floor has three of the six bedrooms that are individually decorated in a palette of pleasing pastels. The rest are upstairs on the second floor, which provides separate living space for diverse age groups. 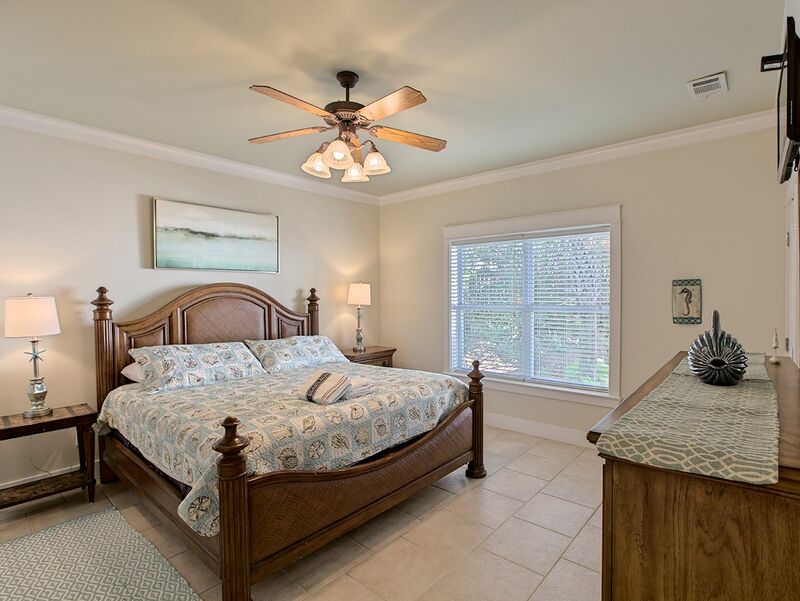 The first floor Master Bedroom has a comfortable king size bed and full bath en suite. The other bedroom has a nice queen size bed and the third is a bunkroom with two twin bunks for the kids. These two rooms share a full hall bathroom. A separate formal dining room on this level has a long rectangular dining table with eight seats. Four bar seats face the open kitchen that has cream-colored custom cabinetry, stainless steel appliances and a side-by-side refrigerator. The spacious main living area with a wall of sunny windows on the second floor has access to the breezy balcony that looks down on the pool oasis. This room has milky white tile flooring, which is richly accented by vibrantly colored and fashionable furnishings. Two additional bedrooms on this floor also have private full baths en suite. The other bedroom has access to a full hall bath that doubles as a convenient powder room. Modern amenities include wall mounted TVs in all six bedrooms as well as the living room, den and Tiki Bar. The third floor encompasses the bonus room den, which has a Sleeper Sofa and roof top balcony with a bird’s eye view of the neighborhood. Gross annual rental income last year was $85,000. The list price of 140 Open Gulf Drive is $949,900. 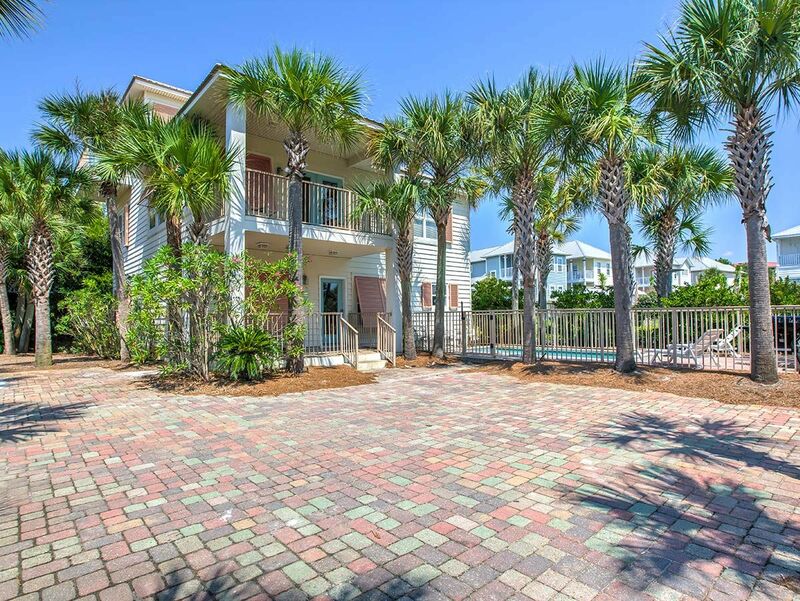 For sale at 156 Open Gulf Street is another six-bedroom home with seven bathrooms, but this one comprises 3,024 square feet and is known as Wiki in the Tiki by its vacationing guests. Besides being only a short stroll from the sparkling white beach, it has its own seasonally heated pool, which measures 10 x 20 and is nestled in among lush tropical plants and palm trees. It also comes with a poolside Tiki Bar with a refrigerator and flat screen TV. 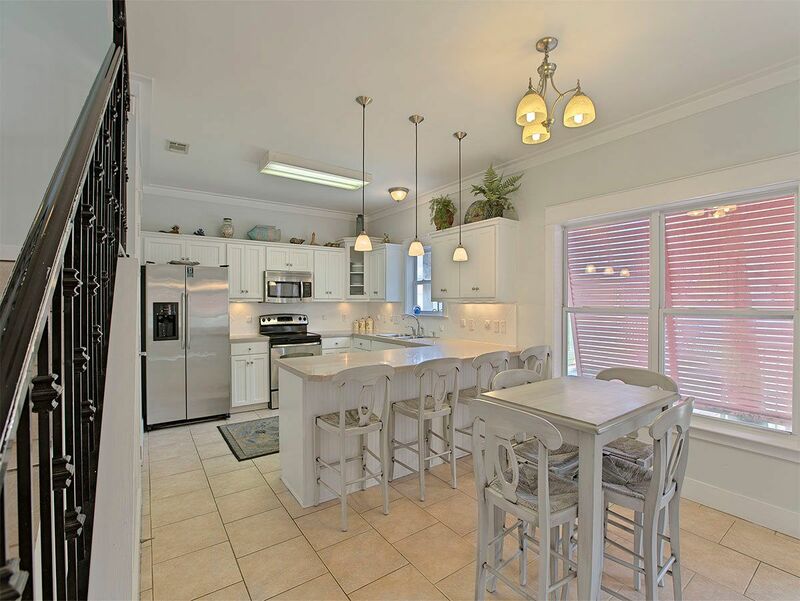 This Miramar Beach home has freshly painted interiors throughout and some updated furnishings. There’s a Master Bedroom Suite on all three floors and each includes a private luxury bath. They are stylishly decorated with comfortable furnishings and include king size beds. The upper two stories have breezy balconies while the Guest Bedrooms have something for everyone and are completed in vivid colors with a tropical flourish. One is a Bunk Room with two twin bunks. 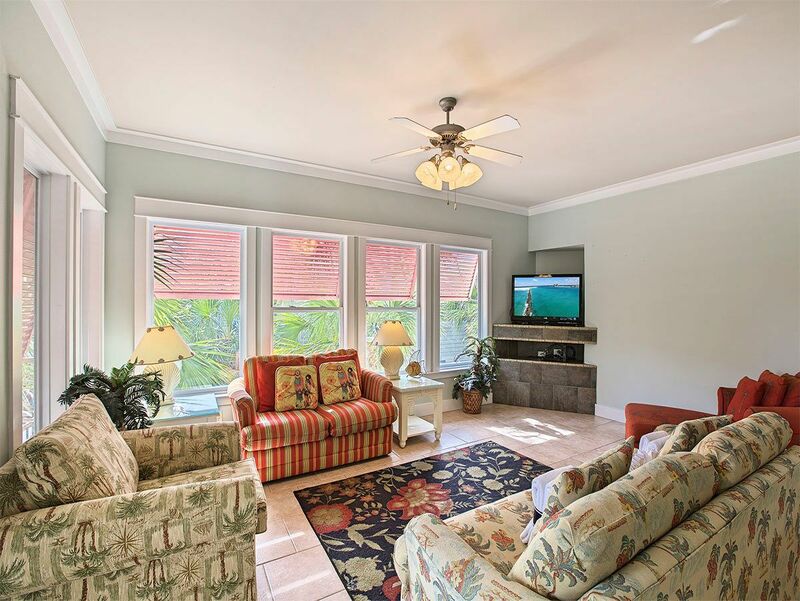 Flat screen TVs are provided for entertainment throughout this hospitable home. The spacious main floor has an open area encompassing the kitchen, dining and living areas. The living area has a comfortable ensemble of furnishings while the contemporary kitchen features stainless steel appliances and a Breakfast Bar with five seats. A formal dining table accommodates eight more. Another lovely colorfully decorated living area is located on the second floor with balcony access. Gross annual income last was $79,000. The list price is for 156 Open Gulf Street is $999,900. It should be noted that neither house requires Flood Insurance or an HOA fee, which is a significant savings. Call our Ocean Reef Real Estate office today as (877) 392-6085 to schedule a tour before the busy rental season begins!